Aberdeen and Hearts away next for St Mirren. I reckon Kearney will walk. He was always an odd choice for me. I hope he stays though. However, if there is more to come, I am sure there will be a little place in Heaven for me ..."Many called but few were chosen"
Butcher by name butcher by nature. Callum OFF, United down to 10 men. Duckens Nazon who turned down United for St Mirren makes it 1-2. Nervous last 10 for United, we might get the draw yet. Fingers crossed. A dodgy penalty would be perfect. Alas, t'was not to be. United progress, Kearney's p45 being started, I reckon. Prefer it to be Killie who are more certain to dispatch them and not very remunerative. You reckon? They backed him pretty well in January. 3 managers in your first season back up would be pretty mental. I suppose all said & done, whatever happened to day with the "ither lot" should be of no concern to us. They won today & so are in the next round ... But they are never gonna win the cup , So does it really matter? Like us, they appear to have made good use of the Jan. window, which if it goes to plan, will probably see them in the play-offs, even win promotion (of course none of this may ever happen) which will mean another season doon there, ootwith the Premiership. I am no' gonna be disrespectful to them ... But surely now we should now have the added power & strength. A DFC win against Livi will give the Club, Manager, Fans/Supporters the impetus & belief, that we will do it. DUNDEE FC ... DUNDEE CITY'S PREMIERSHIP CLUB. At least we don't need to worry about any off these two in the relegation battle . we won't finish 12th cause st mirren are sh**e, and DAB are not good enough to beat us in the play offs they are poor. I would not want to have to finish 11th and end up playing them in the play off's... I don't think my heart could take that as I always hate playing them. I would rather finish 10th and not have to deal with any play off's and let Hamilton have to worry about that. It seems that Hamilton are having a bit of a new manager bounce at the moment but I suspect that will ear off and they will be back to playing gash. I would like to think that the way we played against Kilmarnock in the first half is what we could be looking forward once most of the players are back to being 100 match fit, and if we can play like that till the end of the season then we could be more than a match for most of the teams around us. 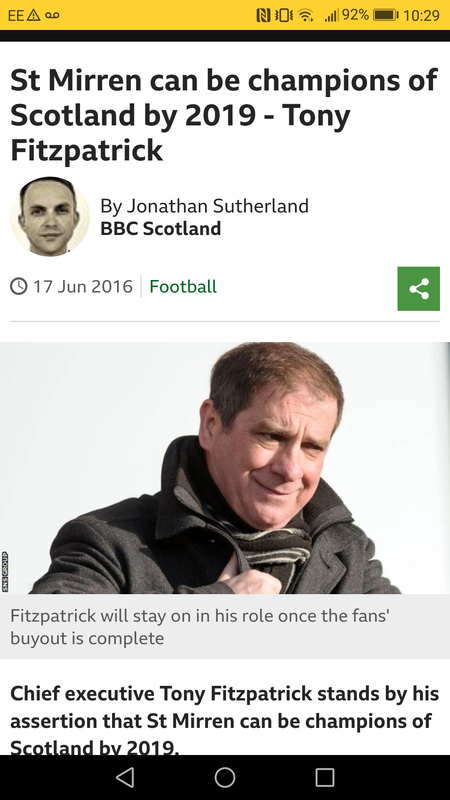 Tony Fitzpatrick says they're a "top four" club. Three managers in one season is nothing. Not really going to plan, is it Tony? I think that confirms Paisley is the drugs capital of Scotland. Tony Polony talks out of his erse as usual. To be fair to Jonathan Sutherland he really picked a good picture to accompany that statement.